What would making $1.5mm a year look like? How about living pay check to pay check, and one bad real estate deal away from bankruptcy. This is exactly what happened to one physician before he became my client. He is a partner of a very large practice and brings home more than $1.5mm a year, and yet he has only $100,000 in his bank account. If he stops working today, the money will run out in three months. How did he get into such a quandary? In short, real estate. My friend Sally has a friend who is a software engineer at Facebook. 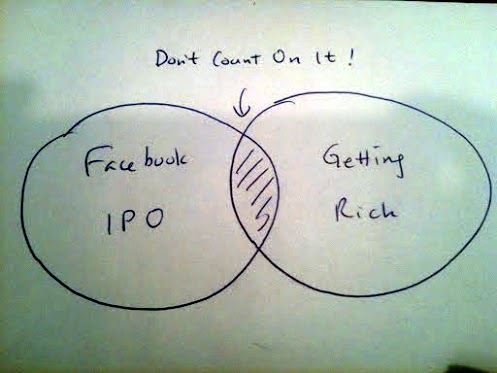 The recent Facebook IPO made him a millionaire, many times over. According to Sally, he is overwhelmed by this sudden wealth and wondering how to deal with this mountain of money. I have a suggestion: put the money in nine buckets. Let me explain. 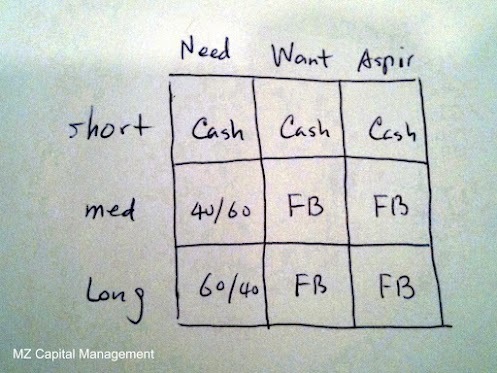 All you newly rich Facebook employees need is a framework to deal with your money. It is a 3 by 3 box. Horizontally, it is divided into Need, Want, and Aspiration. Vertically, it is divided into Short, Med, and Long. 1. Facebook is a great service to help you keep in touch with friends and family. But a great service does not equal great investment. 2. When was the last time you clicked on a Facebook ad? I can’t recall when I ever did. The click-through rate for Facebook ads is 10% that for Google ads, for good reason. Google ads are delivered at the moment you have actionable intent, while Facebook ads are delivered when you don’t want any distraction. 3. 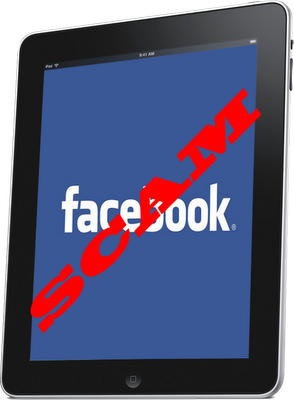 As more and more people use mobile devices to access Facebook, this will present a big challenge since it is nearly impossible to display distracting ads on tiny mobile screens. Two months ago, I got a call from client of mine, who asked my opinion about an opportunity to invest in pre-IPO Facebook shares. He explained that he and his business partner were offered the opportunity to invest in a private fund that will hold Facebook shares. I know nothing about these funds, but I told my client to stay away. As a general principle, I always steer my clients away from private funds unless they run the funds themselves. The reason is very simple: these are unregulated vehicles where there is no government oversight and there is no transparency whatever. You don’t know what monkey business they do with your money. Most business people intuitively grasp that if the private deal is about starting a restaurant; but once the deal is about buying Facebook shares, many of them throw caution to the wind. I met Joseph in a startup networking event. He was trying to attract investors for his latest venture. He has an impressive resume: he founded a tech company that was later sold for tens of millions of dollars in the 1980s. I was immediately struck by the “never say old” motto of this 75-year-old entrepreneur. But one thing did come across as odd: he was trying to raise a mere $500k for his new venture. Why didn’t he just fund the venture out of his own pocket? Two months ago, we bought another investment property. The condo with two bedrooms and two baths was being sold through a short sale. The asking price was only $80,000. We did our research; the condo could rent for $1,300 per month in the market. So it’s a no-brainer. At the time, there were four other bidders. We decide to be aggressive and employ an escalation clause. We would bid $80,000, but if someone bid higher than us, we would increase the bid by $500 increments, up to limit of $95,000.